The whole concept and direction of the Casual Connect magazine cover was laid out by Chester. The idea was to create a new image to highlight the epicness of the Super V theme while conveying motion. Red Star once again led the group through Silver City while looming in the background was the colossal Robo-V. Once Chester got the layout down, he then gave it to rest of the art team. Aileen then did the inks. The lines were given varying weight to further define the team from the background and the forms of Robo-V from the rest of the city, while still giving the overall piece a cartoony vibe. Eveth and Ruben were up next; Ruben did the background color details and Eveth did the characters. The key was getting the lights and shadows right. 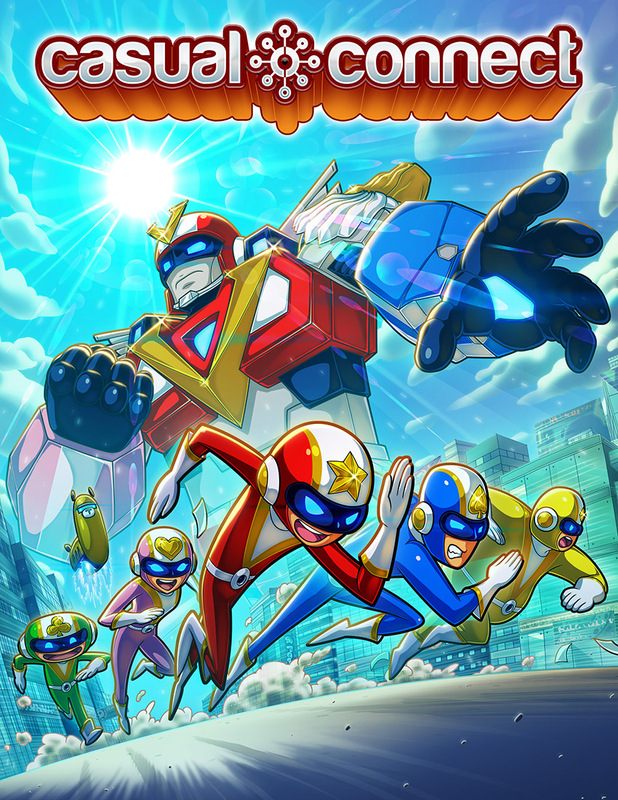 For those countries with access to Run Run Super V’s open alpha, we’ve also updated the start screen with this new artwork. We hope you like it and thanks for reading!